The hardest part of a bike race can be in the mind, playing the patience game and knowing how to best use your strength rather than wasting it, says Tiffany Cromwell. 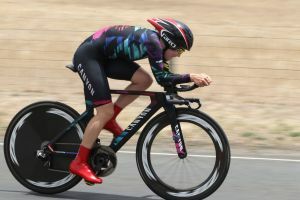 After numerous near-misses in the Australian road championships, the 27-year-old believes she has found the balance needed to make the best of her winning chances in the 102 kilometre women’s elite road race at Buninyong in Victoria on Sunday. With six top 10 places to her name – including second to NSW’s Amanda Spratt in 2012 – she is as well placed as ever despite having no teammates and racing against full teams like the Orica-AIS line-up of Spratt, the 2013 and 2014 winner, Gracie Elvin of the ACT, and last year’s runner-up Rachael Neylan of NSW. Alone and only 166 centimetres tall and 50 kilograms, Cromwell is hardly a stand-out figure in the peloton. But as she has often shown on the world circuit, she can set a race alight, especially on hillier courses such as Buninyong. Do not let the blonde South Australian’s trademark multi-coloured nail polish and penchant for jewellery, skin care products, cuisine, fashion, shoes and shopping fool you. Cromwell is a feisty racer, as shown – among other results – by her fifth in the 2014 world title road race at Ponferrada, Spain; victory in the 2013 Omloop Het Nieuwsblad classic in Belgium, and stage five win in the 2012 Giro d’Italia Femminile. And as her best result of third in Thursday’s national title time trial showed, Cromwell, the sole Australian on the German Canyon-SRAM team, has form. So when she sets off for the first of 10 10.2km laps of the Buninyong circuit in Sunday’s road race, the least she will be worrying about are the odds against her. On the contrary, she will be thinking of opportunities, and the moment to strike. Cromwell hopes to show that winning without a team is possible, as did Victorian mountain biker Peta Mullens who beat Neylan in a two-up sprint to win last year. Cromwell attributes her strong form to a change in preparation. She did not race in the Bay Cycling Classic series in Victoria last week but since November 1 has trained at her European base in Monaco – often riding with British world road champion Lizzie Armitstead – and with her Canyon-SRAM teammates on a training camp in Majorca. “I have been a lot more focused, really learned from my mistakes and [have] worked on the one, two and three per centers. I’m in a really good head space,” Cromwell said. “I have matured a lot as a rider. I have learnt how to contain my energy a little. I have always been tactically smart, but when I have been in the position I haven’t always used my tactics the best. Obviously I have a huge target on my back and [from her former team] Orica[-AIS] … I know the tactics they will play against me. The lure of a winning ride boosting her Olympic selection hopes is added motivation for Cromwell, especially after just missing out for the 2012 Games.